A new tool could clarify where rain comes from now, and where it might come from under future climate scenarios. A drop of rainwater that falls on a cassava field in Uganda takes a different path than one that falls 500 miles east in Somalia. Better understanding of its origins is important for the millions of people who rely on subsistence agriculture to survive. The new method leverages signals in water molecules to decode the atmospheric processes that accompany changing tropical weather and climate patterns. “The tropical water cycle is more than just precipitation,” says Bronwen Konecky, assistant professor of earth and planetary sciences at Washington University in St. Louis. What’s happening in the tropics? Konecky’s work relies on atomic-scale differences in the mass of the hydrogen and oxygen that make up water molecules as a kind of persistent fingerprint that records where water has traveled and what has happened to it even before it fell as rain. Climate researchers around the world use this same type of isotopic data to examine water. They rely on modern-day rainfall monitoring along with geologic reconstructions that help them to estimate the quantity and properties of rain that fell in the past. But as laboratory and satellite-based methods for measuring water isotopes have improved in recent years, Konecky and others observed that the rules of thumb they had been relying on to estimate precipitation from geologic proxies did not adequately describe what’s happening in the tropics. Konecky’s new paper helps reshape the story. Her number one lesson from parsing the data in dozens of previous climate research studies? Location matters. “Where the water is coming from turns out to be an important part of the isotopic story that we can read in tropical rainfall,” she says. For her part, Konecky has recently established several projects to measure water isotope variations at poorly studied sites in Africa, southeast Asia, and the tropical Pacific. Last year, she started a new project related to rainfall variability in Uganda. More than 80 percent of the population in Uganda lives in rural areas and relies on subsistence agriculture, according to estimates from local aid organizations. “What I’m doing with my research now is going out and actually collecting the rainwater so that we can interpret climate and weather processes from the isotopic signals,” says Konecky. Rainwater collectors—custom-built in Konecky’s laboratory at Washington University—are installed at five locations across western Uganda. Konecky will analyze the isotopes in the water she collects to learn where this rainfall originated. Much of what rains down on East Africa is carried over from the Indian Ocean, the closest major body of water. However, an unknown but likely significant amount of rainwater comes all the way over from the Atlantic. It moves over the continental interior and is recycled through the Congo rainforests before it ends up in Uganda. 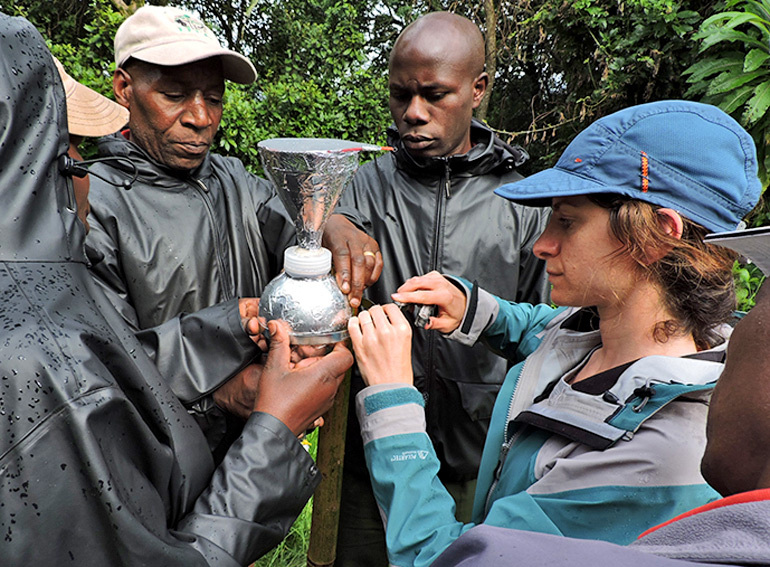 One continuing challenge: keeping baboons out of the rainfall collectors. “They like anything shiny,” Konecky says. Konecky is working with collaborators who specialize in physical and human geography. The National Science Foundation supports the work, which appears in Geophysical Research Letters. Is it true that ‘rain follows the plow’?